Last month we announced some exciting new changes to the FIN framework: FIN 4.0. Just to recap, FIN 4.0 completely changes the engineering workflow by using both HTML5 technology and tagging and data modeling. It is a complete Building Automation System (BAS) and Building Operating System (BOS) framework. We haven’t stopped fine tuning what FIN 4.0 can do thanks to feedback from the FIN community. The power of FIN has been extended to now support equipment checkout and automatic commissioning. We’ve been hard at work building and beta-testing with the team at NREL, the U.S. Department of Energy’s National Renewable Energy Laboratory. We’ve brought together Project Haystack, tagging and data modeling, and FIN framework to bring you our next new feature: Automated Commissioning. Commissioning is a very important task when it comes to running an intelligent building. It’s also extremely time consuming to perform all of the initial tests to ensure that every function is working as it should. Pair that with the need for ongoing retro commissioning and you’ve got a systems integrator spending a large portion of time on the task of commissioning. Not if you’ve got FIN technology installed in your building! 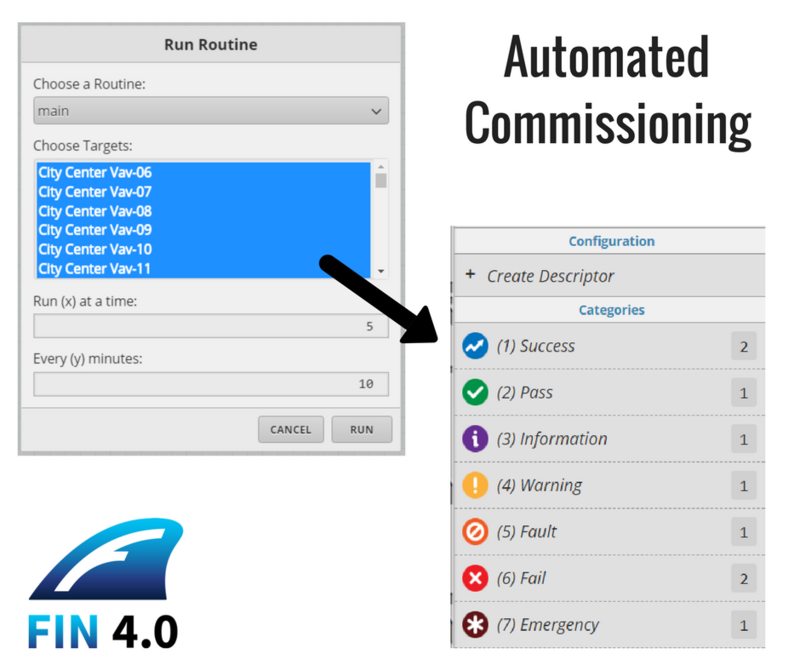 Automated commissioning gives you the ability to create a set of tasks and apply them globally across an entire system of equipment. Each step is executed automatically and the results are summarized in a checkout/commissioning report. No more spending hours manually checking sensors, stroking dampers, and recording results. Want a Closer Look at What Automated Commissioning Can Do? We’re so excited about our latest FIN feature and can’t wait to share it with you. Learn how the use of tags fundamentally automates the entire process of engineering a project and see for yourself how automated commissioning works in our upcoming webinar. Wednesday, July 26th. Click here for details or to register.